throwing corncobs at the tattered scarecrow. cawing and jawing out names as they go. ignoring her warnings, her pleas to reform. just fast flying hoodlums unfit for a farm." If you need proof that poems need to be read aloud, do an experiment with this book and see how words come alive when you share them. 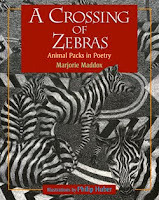 In this homage to collective nouns, Marjorie Maddox uses inventive wordplay, precise language and humor to describe for us a wide variety of animal 'groups'. In her lovely, informative note at the back of the book, she refers to the 'collection of librarians' whose help was invaluable while she was doing her research, and learning about the many collective nouns that have evolved down through the ages. I have mentioned before that the best books combine perfectly chosen text and memorable art. Philip Huber's illustrations are often as humorous and descriptive as Marjorie Maddox's words. Readers will find much to peruse as they share these thoughtful poems and the very literal images. Text placement adds to the experience with a tower of words for the tower that giraffes form, and the scarecrow's expression as she falls victim to the 'murder' of crows that surround and intimidate her. Each time I read this book, I make a new discovery. I look forward to sharing it in classrooms I visit. Check it out!